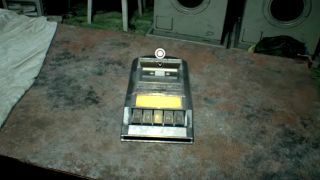 Obviously Resident Evil 7 has decided to modernise slightly, replacing its old typewriter based saving system with tape cassettes instead. It's a step in the right direction at least. The new system has been revealed in one of two new videos called "Recorder', along with the name of the level being saved 'Escape from the house' and an 8m46s time suggesting this is very early on in the game. We've heard previously from producer Masachika Kawata that Resident Evil 7's saving will be a combination of auto and manual options. And, apparently, if you chose harder difficulties "the save system will not be so nice to you". That's clearly some sort of health/stat display. There's been no HUD visible yet so it looks like the game is pulling that sort of information from in-game objects. The second video below, called 'Stock Up', shows something very familiar: a crate being smashed with a knife. Capcom has spoken about how there will things fans will recognise - herbs and the like - and this is clearly a reference to the old games. There's going to be another six of these videos on that way, presumably with each one teasing out something new. I'll keep you updated.